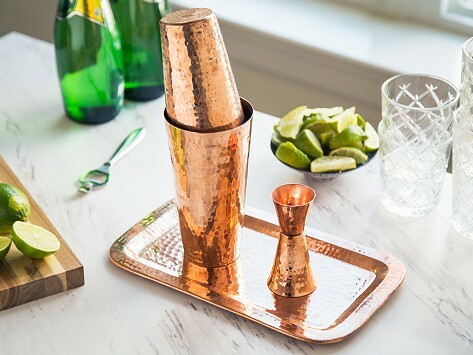 This pure copper barware set is created with 1,000 years of tradition. Each piece is handcrafted in Mexico, where the method originated. The result is a hammered surface that shines with rich history. With a full set of implements—jigger, shaker, and a tray—you are ready to impress the crowd at cocktail hour. Dimensions: 12" x 6" x 1.5"
Fluid Capacity: 18 and 30 fl. oz. Dimensions: 30 oz. : 3.625" x 3.625" x 7"; 18 oz. : 5.25" x 3.25" x 3.25"
Fluid Capacity: 1 and 2 fl. oz. Dimensions: 2" x 2" x 4.2"
1,000 years of tradition are behind the copper mugs, trays, and other barware from Sertodo Copper. They believe the oldest way of working with copper is still the best. All of their pieces are handcrafted in a remote Mexican village where these methods began. Founder Jonathan Beall started Sertodo back in 1997, and is committed to bringing this ancient art into the 21st century without sacrificing quality. Artistans use pure, recycled copper and hammer it to create a rich, textured finish with eye-catching shine. Because it’s genuine copper, it will develop a matte patina over time. But it’s easily polished off to restore the shine if you prefer. 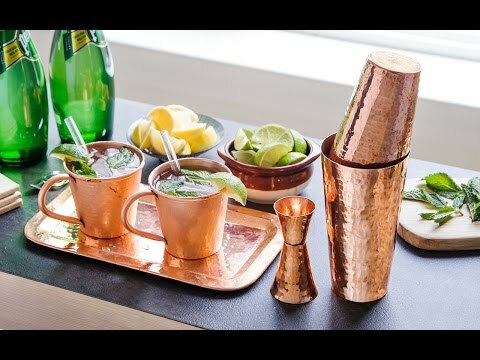 Copper is also naturally antibacterial, anti-fungal, and anti-microbial so it’s a great material for mugs, jiggers, and cocktail shakers. And the trays can double as accent pieces, when they’re not busy serving food or drink. With pieces so rich in history—and that look so good—we think you’ll find yourself admiring them beyond happy hour.